Alberta’s coal communities have access to new funding for locally led projects that support regional economic development. 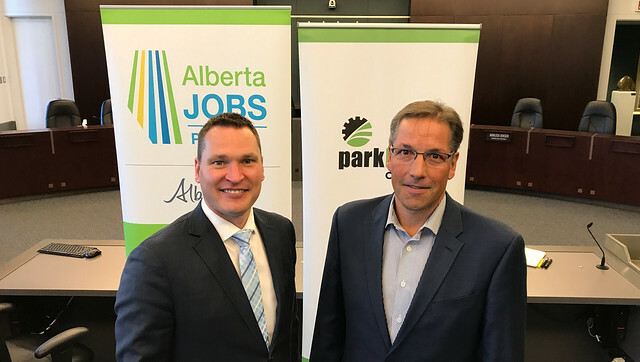 Economic Development and Trade Minister Deron Bilous joins Mayor Rod Shaigec in Parkland County to announce the new Coal Community Transition Fund. The Coal Community Transition Fund will be available for projects that focus on regional partnerships and economic diversification. The fund, which is also expected to grow with additional support from the federal government, is one step in a series of initiatives to support coal communities and workers as Canada moves towards natural gas and renewable electricity generation and away from coal. The Coal Community Transition Fund guidelines recognize the unique challenges faced by communities in transition, and eligible communities and municipalities can apply together or individually for grant funding based on their specific economic development opportunities. Applicants do not require matching funds from municipalities. Intake for the Coal Community Transition Fund is now open and will run until Nov. 30, 2017. Details, including eligibility criteria and how to apply, can be found here. The first project to receive support through the fund was the Town of Hanna’s Community Action to Create Diversification project. The Coal Community Transition Fund represents one of a number of measures the Government of Alberta is taking to support coal communities and workers. The province remains in contact with the federal government for additional support. Minister Bilous met with coal communities the last week of August to hear directly from affected workers. In addition, the government is expecting the report from the Advisory Panel on Coal Communities sometime in the fall, which will provide further recommendations to support coal communities and workers. Canada is one of many countries moving towards natural gas and renewables – while moving away from coal-powered electricity. In 2012, the Harper government approved regulations to end coal-powered electrical generation at Battle River and Sundance in 2019, at Keephills in 2029, and at Sheerness starting in 2036. In 2014, the Harper government introduced regulations that would have prevented all Alberta coal plants from converting to natural gas. The Trudeau government has since shortened Canada’s coal phase-out deadline to Dec. 31, 2029. The Alberta government is working to ensure coal communities continue to power our province, by securing exemptions from the Trudeau government that will allow coal plants to continue operating past federally mandated end-dates by converting to natural gas. This lines up closely with the Alberta government’s Climate Leadership Plan, which will create 7,000 jobs by phasing out coal and transitioning to renewable and natural gas-generated electricity by 2030. The province also commissioned a coal transition report from world-renowned energy expert Terry Boston. He has worked on complex energy issues for decades on four continents. Boston oversaw the successful transition off coal for one of the world’s largest electricity grids. These steps provide options for transitioning to new electricity generation that would see coal communities continue to power Alberta and create new long-term, local economic opportunities. Recognizing that both communities and workers will be affected during the transition – even with construction and operating jobs in natural gas conversion – the province also appointed an Advisory Panel on Coal Communities. The panel will provide recommendations to support retraining and other opportunities for workers – and to support regional economic development. The government will share the panel’s feedback when the panel completes its report this fall.